A report on Friday claims Apple is nearing release of an iOS update that looks to address an email attachment encryption issue, a lock screen vulnerability and enhanced iBeacon support, among other minor bug fixes. 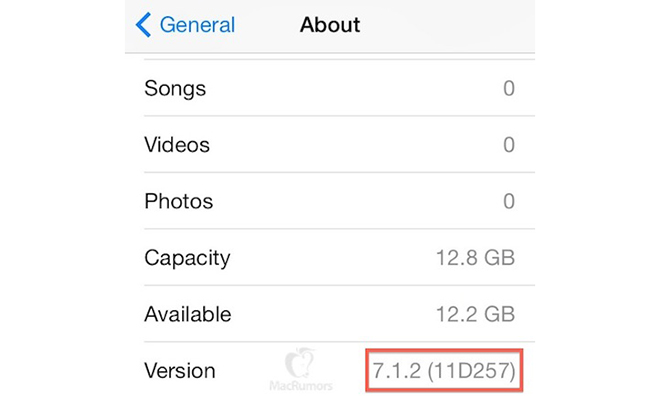 Citing a source familiar with the upcoming update, MacRumors claims Apple has distributed iOS 7.1.2 to carrier partners for testing ahead of a release sometime within the next two weeks. The minor point update supposedly contains a number of bug fixes and security patches, including a resolution to an email encryption issue discovered in April. Security researchers proved the flaw, which prevents email attachments to be saved with proper encryption protection, exists in recent iOS releases as far back as iOS 7.0.4. Following the release of iOS 7.1.1 two months ago, Apple said it was aware of the issue and would soon issue an update to patch the flaw. In addition to email encryption, the upcoming iOS 7.1.2 is also said to address a problem in which the Mail app fails to download email messages. Sources also claim the upcoming iOS version will include a fix for an unspecified Lock Screen vulnerability that could allow access to "limited apps." A final minor bug fix deals with data transfer from third-party accessories. Finally, the purported iOS 7.1.2 update will include enhancements to iBeacon connectivity, but again the report is unclear on specifics. It can also be speculated that Apple will fix a long-standing problem with iMessage that occurs when a user switches from an iPhone to a non-iOS device without properly disassociating their phone number from Apple's service. In some cases, iMessage will continue to intercept incoming texts and will not forward them to a user's new device. Apple promised to fix the issue in May.